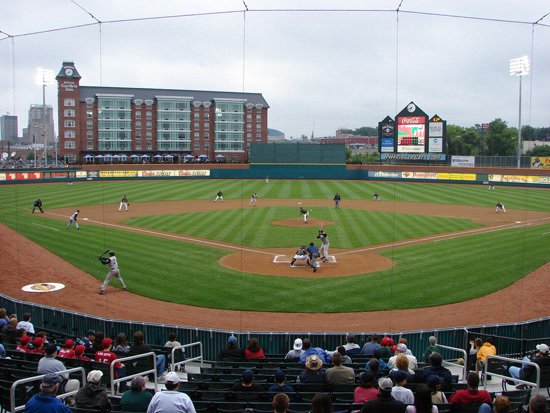 The New Hampshire Fisher Cats, a Double A affiliate of Toronto, play at Merchants Auto.Com Stadium in Manchester, NH. 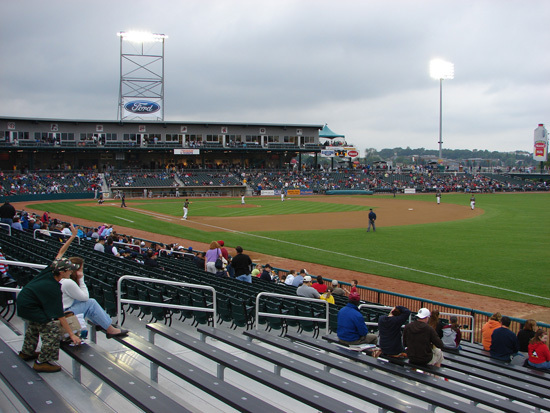 The stadium was built in 2005, seating 7,000 when the team moved to Manchester from New Haven, CT. 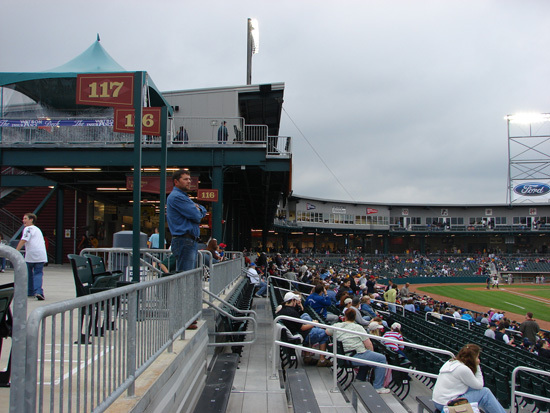 It is a nice new stadium, but not built in a very accessible area. There is not sufficient parking close by the stadium. 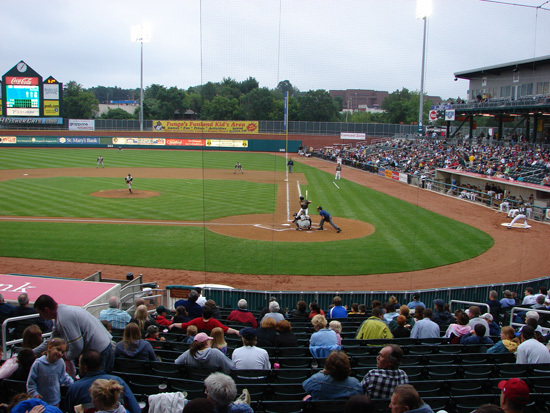 There is a little street parking or $10 parking on private property within two blocks of the stadium. Otherwise you must walk from 8-10 blocks to get to a parking garage or free parking. 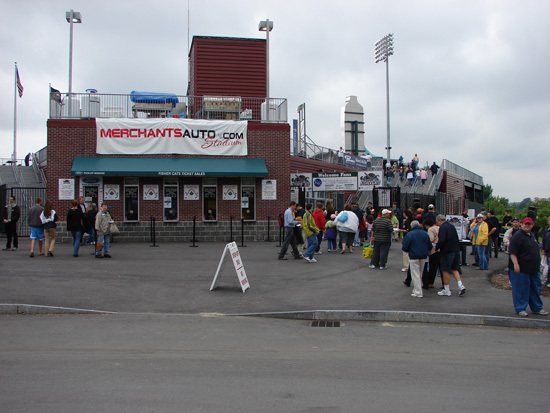 There is only one street and entrance to the stadium. Most of the seating is seats, but there are some unbacked bleachers down at the end of each baseline. 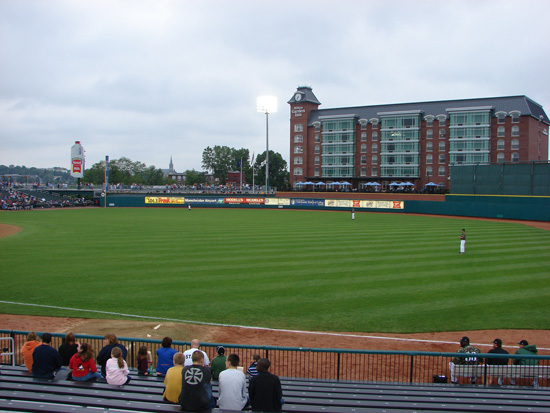 Nice big new hotel beyond the left field wall where you can watch from your room or the patio on the front of the hotel. Seating is all fastened to aluminum stands. 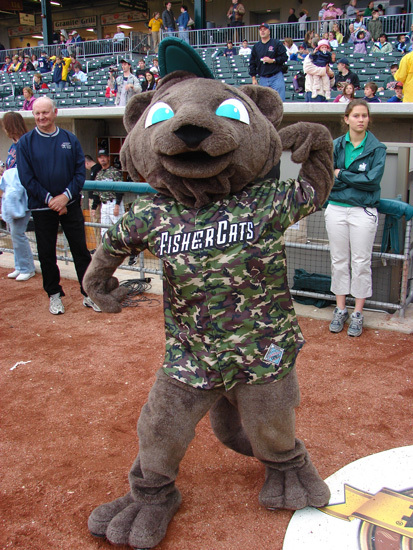 The Fisher Cats were playing the Altoona Curve and lost 3-0. 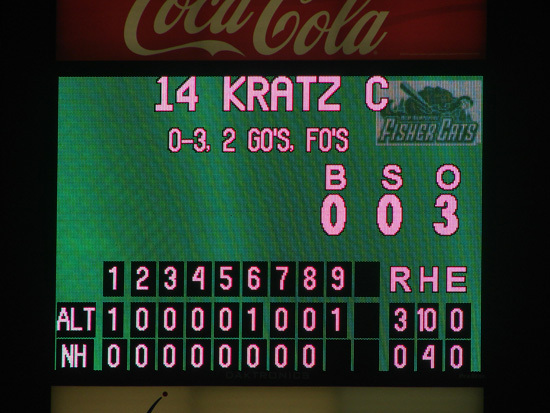 The box score was Curve R-3, H-10, E-0 and Fisher Cats R-0, H-4, E-0. 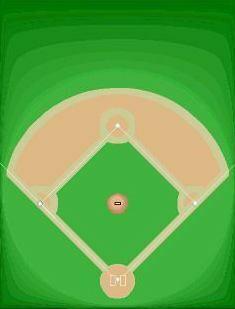 Field lines are RF-306', RC-353', CF-400', LC-380', and LF-326'. Pretty good menu, with one area that sells different seafood selections. 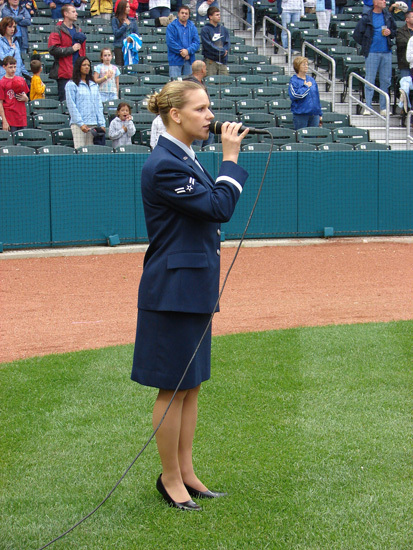 Before the game military active duty personnel and veterans were invited on to the field. 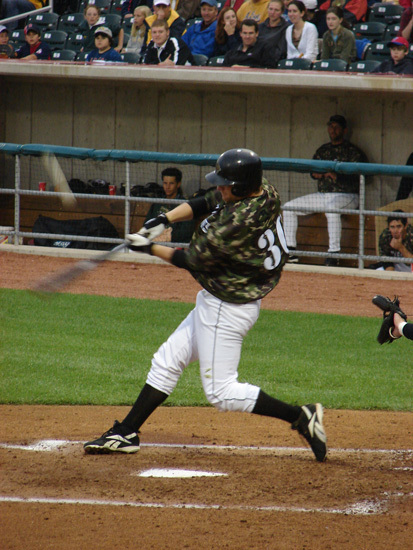 So Jim was able to get some good photos. 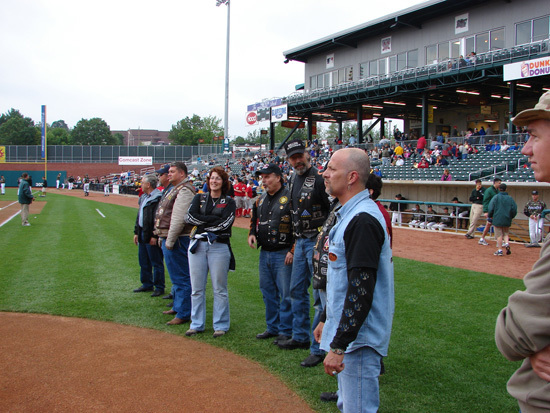 First was a group of veterans who provide support at military funerals by riding their motorcycles rode around the warning track and then joined us behind home plate. 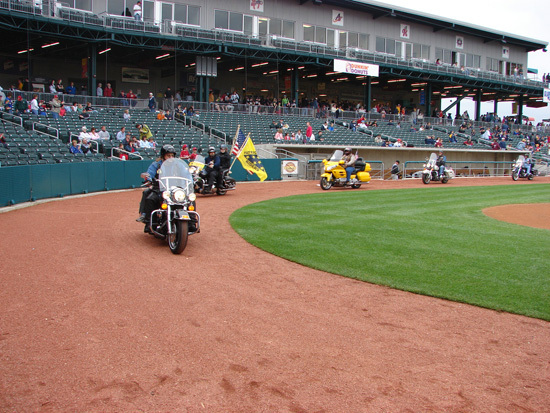 Several had made the Veterans' Ride to Washington D. C. Memorial Day week-end. 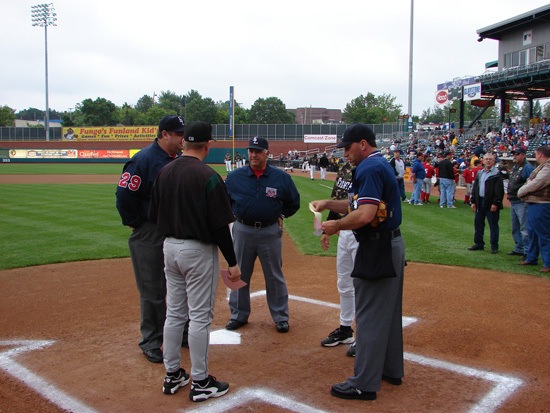 Coaches are exchanging the line-up list with the umpires. 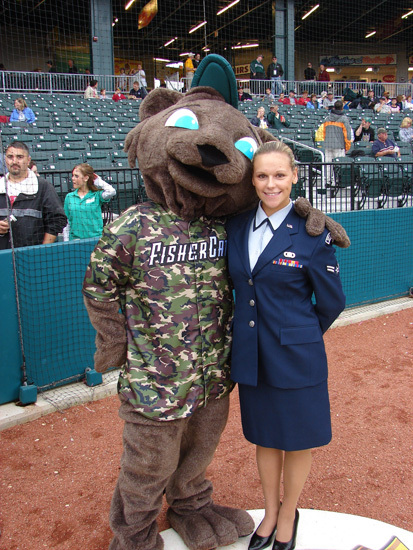 Fungo is the mascot and is shown with the young airwoman from the US Air Force Freedom Band who sang the National Anthem. 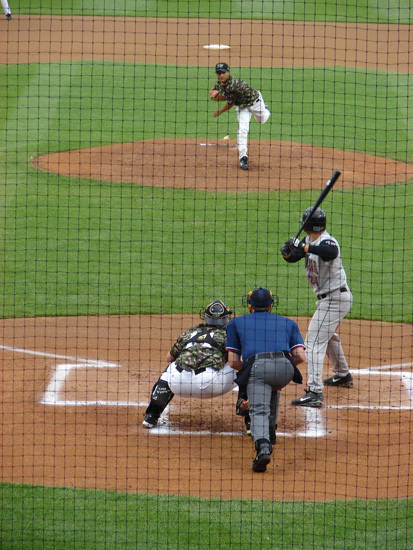 Some different between inning activities. Musical seatbelts--the individuals run around the cart and jump in and put on their seatbelts. The last one to put on his/her seatbelt loses. 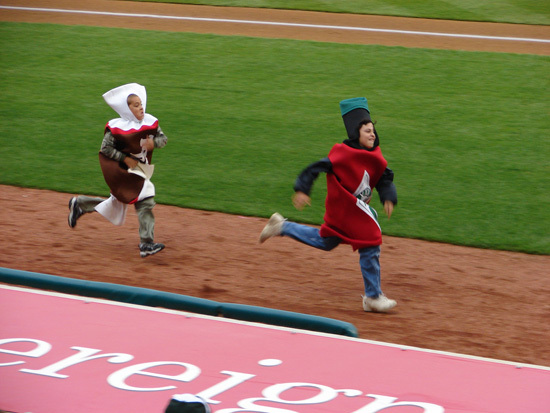 A race between 4 boys wearing different costumes-hot sauce and tootsie roll are shown, following were mustard and bologna. 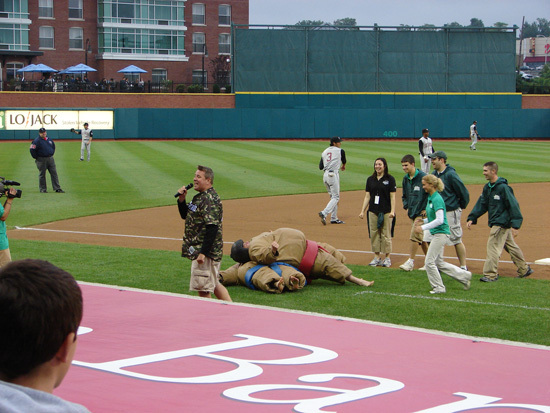 Sumo wrestling seen in the past, but this time game staff were the opponents. 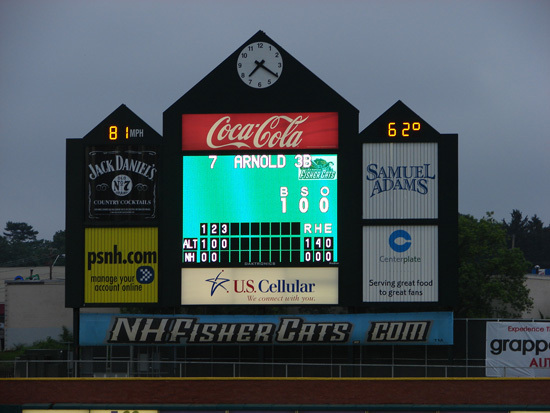 There are rotating advertising signs on the outfield fence wall. By the end of the game fog was blowing across the field at roof level. 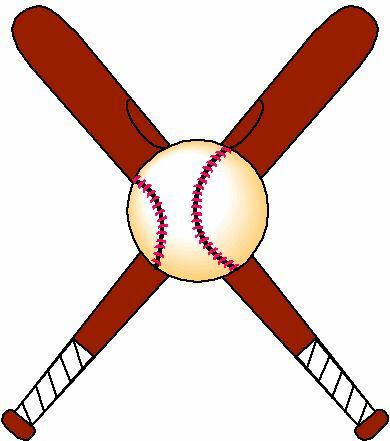 New Logo 2011. 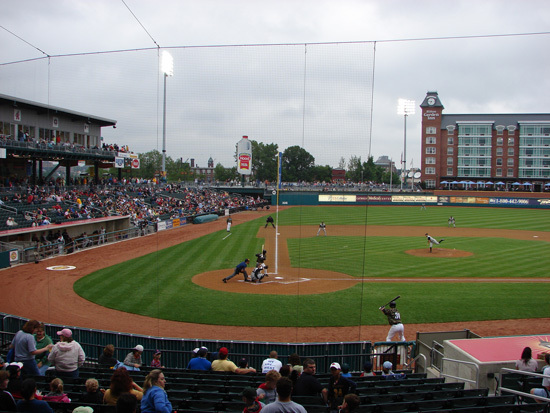 2014 ballpark name Northeast Delta Dental Stadium. The Currier Museum of Art--displays European and American paintings, sculpture and decorative arts from the 13th century to the present. Available through the museum is one of Frank Lloyd Wright's Usonian houses-The Zimmerman House. Reservations are required. Fees.